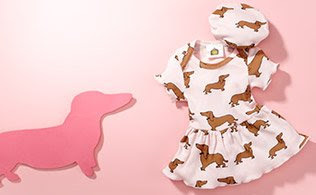 Romantic annd Warhol roses, pink butterflies and wiener dogs - these outfits are so cute! My favourite? Skirted Bodysuit with Hat - what's yours? 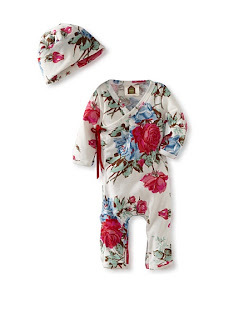 Addictive prints from Barn Organics make wonderful baby gifts, as well as irresistible additions to your little one's wardrobe. Must-have shapes like kimono tops and dolly dresses are not only cute, they're extremely practical and easy to get on and off in between changes and bath time. NOTE: If this is your first time, after you sign in, click on the "Children" tab, then "Barn Organics"